Blueberries burst with flavor and nutrition! This luscious lemon bread is my “go to" easy favorite; in fact, close your eyes and you'll think you are eating cake. This recipe is from Holly Clegg's trim&TERRIFIC Too Hot in the Kitchen: Secrets to Sizzle at Any Age. Preheat oven 350°F. Coat 9x5x3-inch nonstick loaf pan with nonstick cooking spray. In large mixing bowl, mix together cream cheese and 1 cup sugar until light and fluffy. Beat in eggs and lemon extract. Stir in baking mix and lemon rind just until blended. Carefully stir in blueberries. Transfer batter to prepared pan. Bake 50-60 minutes or until toothpick inserted comes out clean. Immediately poke holes in 1-inch intervals on top of bread with toothpick. 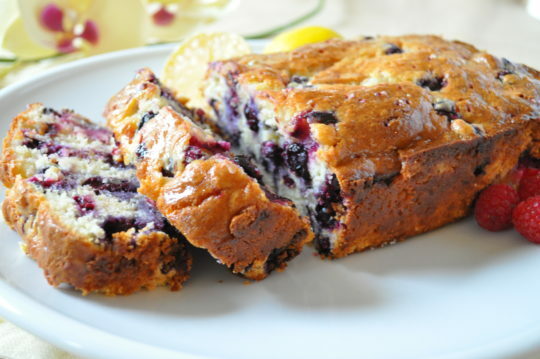 In microwave-safe dish, combine remaining 1/3 cup sugar and lemon juice, heating until sugar is dissolved. Pour evenly over top of bread. Cool and slice. Spicy Advice: If using frozen blueberries, do not thaw before using, or the blueberries turn too mushy.